The kitchens of Spain produce a pungent and imaginative fare. Substantial and plentifully served, the food is usually not highly seasoned. Olive oil, the basis of Spanish cuisine, imparts a subtle flavor to most ingredients. A number of dishes, both national and regional, are to be recommended. Variations on rice-based paella, flavored with saffron and pimentos, are found all over the country. 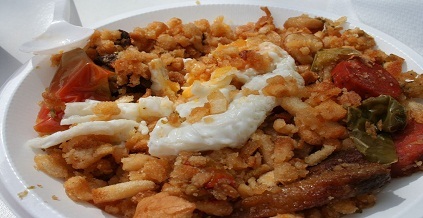 Valencia is known for the tastiest version made with pork, chicken or seafood. Squid (calamares), at their best in the Basque country and Catalonia, are also eaten in other regions. Cuttlefish are frequently prepared in a dark sauce of their own ink or cut up and fried crisp. Gazpacho is an uncooked soup of Andalusian origin. Oil and vinegar are combined with finely strained tomatoes, garlic, cucumber, green peppers and onion. Garnished with croutons, the chilled blend makes a refreshing repast on hot days. Spanish cooks prepare legumes in a variety of ways. Madrid’s special stew (cocido), made with chick peas and beef, chicken or bacon, is a meal in itself when eaten with bread and a glass of wine. Asturians favor a simple cassoulet of white beans with salt pork and sausage (fabada) and Basques choose a peppery sausage (chorizo) stewed with red or white beans. The meals of the Basque nation are likely to include several hearty courses. Salt codfish cooked with fresh tomatoes (bacalao a la Vizcaína) is known in other areas of Spain, as is fish soup (sopa de pescada), a traditional favorite of fishermen. Although at most meals, desserts are not varied. Common after-dinner treats are custard (flan) and ice cream (helado). This culinary lapse is more than compensated for by many varieties of fresh fruit: oranges, melons, grapes, dates and peaches. A serving of any of these with a piece of regional cheese, a good mild one being Manchego, marks an indulgent end to any meal. Coffee may be ordered black (solo), with a dash of milk (cortado), or white (con leche). A large cup is a doble. Spaniards generally eat later than other nationalities. Spaniards in the South of Spain eat even later than those in the North. In hotels patronized by tourists, it is now possible to order breakfast, usually of the simple continental variety, as early as 8 a.m. (and as late as 11). Most often, lunch, the main meal of the day, is taken between 1 and 4. Restaurants begin serving dinner at 8:30 or 9 p.m. and stop at midnight. 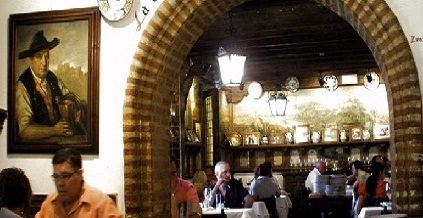 Many cafes offer tempting snacks (tapas) for those who find it hard to hold out until scheduled meal times. Seafood is the most common, but sandwiches and several varieties of sausage can be purchased as well. With all of these, Spaniards drink wine or beer.